Download a free Betaspec 2 Demo version and user manual. Betaspec Version 2: Bug fixes and modifications list. the 0.2 - 40 micron spectral range. Betaspec 2.0 is a user friendly Microsoft Windows based interface program written in Visual C++.NET which runs the US Air Force BACKSCAT (Version 4.0) program written in FORTRAN. BACKSCAT Version 4.0 uses the LOWTRAN 7/FASCODE aerosol models. The BACKSCAT program is a Lidar simulation program that determines the lidar S/N ratio for a wide range of targets and systems. As part of this simulation, the BACKSCAT program calculates the appropriate aerosol and Rayleigh attenuation and backscatter coefficients for a wide range of atmospheric conditions including the US Standard Atmosphere, clouds, haze, fog, rain, etc. 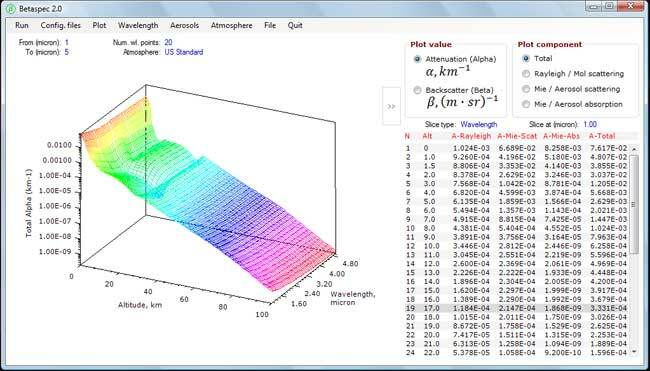 The Betaspec 2.0 program uses the main aerosol attenuation/backscatter kernel of the BACKSCAT program, but adds a user friendly interface to allow the user to easily change the weather conditions and wavelength range of the calculations. The output from the BETASPEC program is a data array of the backscatter and aerosol attenuation coefficients as a function of wavelength and of altitude. The output file (*.BASC or *.ASC file extensions), contains the attenuation and backscatter coefficients due to aerosols (clouds, dust, etc.) in the atmosphere. It should be noted that the Betaspec program calculates the attenuation only due to aerosols and Rayleigh scatter in the atmosphere. Such values are valid for non-resonant transmission through the atmosphere when the optical or laser wavelength is not on a resonant absorption line of molecules in the atmosphere. The HITRAN-PC program calculates the additional attenuation due to resonant absorption of molecular lines in the atmosphere, which can then be added to the attenuation due to aerosols and Rayleigh scatter for the total attenuation. Calculations of aerosol attenuation are also embedded within the Hitran-PC 4.0 program and are used within the Hitran-PC 4.0 program when "Aerosols" are selected by the user.